The smallest PLC's in the world. PLCs in the world and if they are worth the effort of writing a program... or not? Let us have a look at some of the smallest PLC's in the world to see if they have good practical and a rightful place in the automation arena. Or if they're just a nice toy to flash lights and ring bells! 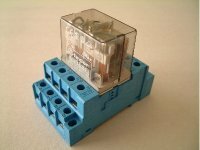 Are they worth the effort of sitting down and putting a program in, or would it be better to use relays on the smaller control circuits? One of the smaller PLC's has to be this one in the picture above. 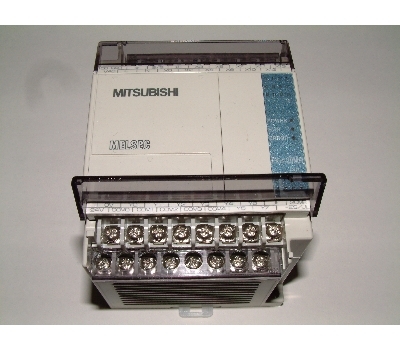 But I don't think the title of 'the smallest PLC' is a clear cut thing, but this one by Mitsubishi definitely qualifies as a contender. For its size it is absolutely packed with power and features. Yes yes I know there are smaller devices that are classed as PLC's but they're not boxed up as neatly as this Mitsubishi. Omron produce a similar item. So there are bound to be more from other manufacturers. So before we go off in search of a title winner, lets see if they are worth the effort. First of all, why would you use one of the smallest PLC's. An eight or ten I/O tiny PLC would not give much more switching ability than a few four pole relays. OK but, there is the fact that they can be programmed or rather reprogrammed fairly easily as opposed to our friendly relay here that would have to be rewired. Ah... yes, the programming, let us just have a quick peek at the cost of what you would need to do that. I could ignore it for now but it does have to be kept in mind for any comparison equation. The program by Mitsubishi is very expensive for the individual, around £800 quid, but it is very good. It's called "GX Developer" and it's the tool with which Mitsubishi PLC's are programmed. I called it a tool because that's exactly what these type of programs are. All the major manufacturers of PLC's have developed their own tool for their own range of PLC's. You use them to make it much easier to instruct the PLC to do your bidding and hence control motors, valves, solenoids and indicator lights in the fashion you want to happen. Without these PLC programming program tools you would not be able to program the majority of PLC's, some you could use a hand programmer. Maybe even some by having to learn machine code programming, which take it from me is not that easy. Other pages you may be interested in is a little PLC History, or find out how PLC's work and what makes a PLC tick.